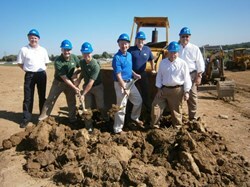 Buckeye Power Sales breaks ground on new bigger facility to accommodate growth. Pictured left to right: Mike Rader, Greg Bohls, Thomas Bohls, Vic Spang, Craig Casdorph, John Westheimer and Larry Knasel. Buckeye Power Sales is relocating from its current Ohio office in West Chester to a newly renovated and bigger space to accommodate continued growth in the company and industry. The company broke ground at the new site late July. Plans show an extra 7,500 sf will be added to a 10,000 sf warehouse which will hold residential and industrial power generators and other merchandise. Also included in the renovation will be a 3,840 office space. The new facility will be twice as large as the current office and will have four times the land, providing the room Buckeye Power Sales needs to sustain the company’s development. Company leaders pushed dirt on a backhoe to commemorate the occasion. The construction is being completed by Cincinnati Commercial Contracting, LLC. Operating since 1947, Buckeye Power Sales is a third-generation family business that is the oldest Kohler Power Systems distributor in the United States with branch locations in Indiana and Ohio. Their service and sales professionals help customers find temporary and permanent power solutions with residential and industrial generators for sale or rent. They are the only authorized distributor of Kohler Power Systems for Ohio, Indiana, and Northern Kentucky. For more information, visit http://www.BuckeyePowerSales.com. Cincinnati Commercial Contracting, LLC is a 34-year-old firm and authorized Butler Building dealer. Buckeye Power Sales Co., Inc.